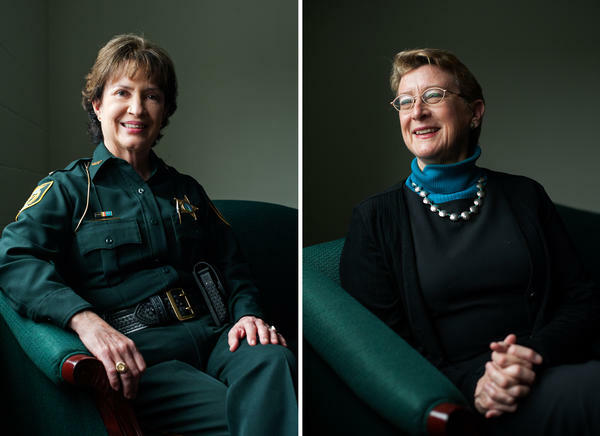 Alachua County Sheriff Sadie Darnell (left) and Dr. Nancy Hardt, University of Florida. 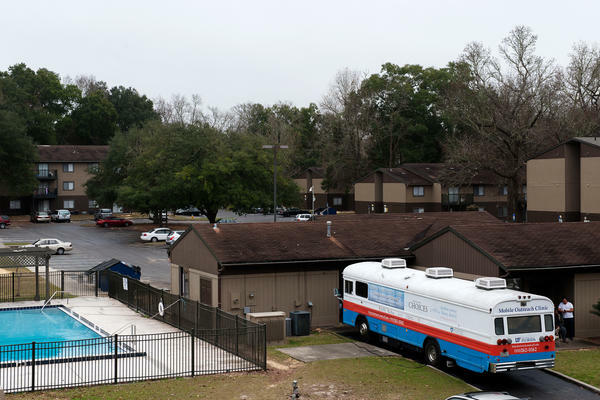 Dr. Nancy Hardt's free "clinic on wheels," parked in December at an apartment complex in Gainesville, Fla., gets about 5,000 visits from patients each year. Physician assistants and undergraduate care coordinators treat patients in the mobile clinic parked at Majestic Oaks, a low-income apartment complex in Gainesville. A few years ago, Hardt says, she learned about some research that changed her view of how exactly that life course — health or illness — unfolds. The research shows that kids who have tough childhoods — because of poverty, abuse, neglect or witnessing domestic violence, for instance — are actually more likely to be sick when they grow up. They're more likely to get diseases like asthma, diabetes and heart disease. And they tend to have shorter lives than people who haven't experienced those difficult events as kids. "I want to prevent what I'm seeing on the autopsy table," Hardt says. "I've got to say, a lot of times, I'm standing there, going, 'I don't think this person had a very nice early childhood.' "
Back in 2008, Hardt was obsessing about this problem. She wanted to do something to intervene in the lives of vulnerable kids on a large scale, not just patient by patient. So, by looking at Medicaid records, she made a map that showed exactly where Gainesville children were born into poverty. Block by block. Right away she noticed something that surprised her: In the previous few years, in a 1-square-mile area in southwest Gainesville, as many as 450 babies were born to parents living below the poverty line. It just didn't make sense to her — that was an area she thought was all fancy developments and mansions. So Hardt took her map of Gainesville, with the poverty "hotspot" marked in deep blue, and started showing it to people. She'd ask them, "What is this place? What's going on over there?" Eventually she brought the map to the CEO of her hospital, who told her she just had to show it to Alachua County's sheriff, Sadie Darnell. And, to Hardt's surprise, Sheriff Darnell had a very interesting map of her own. Darnell had a thermal map of high crime incidence. It showed that the highest concentration of crime in Gainesville was in a square-mile area that exactly overlaid Hardt's poverty map. "It was an amazing, 'Aha' moment," says Darnell. "We kind of blinked at each other," Hardt says. "And — simultaneously — we said, 'We've got to do something.' "
The hotspot is dotted with isolated, crowded apartment complexes with names like Majestic Oaks and Holly Heights. The first time she visited, on a ride-along with Sheriff Darnell's deputies, Hardt tallied up all things that make it hard for kids here to grow up healthy. There's a lot of poorly maintained subsidized housing. Tarps cover leaky roofs. Mold and mildew spread across stucco walls. Sherry French, a sergeant from the sheriff's office, says lots of families here have trouble getting enough to eat. Hardt added hunger to her list and substandard housing. And she noticed something else: almost a total lack of services, including medical care. She mapped it out and determined that the closest place to get routine medical care if you're uninsured — which many people here are — is the county health department. It's almost a two-hour trip away by bus. Each way. This was a problem a doctor like Hardt could tackle. She would bring medical care to the hotspot, by rustling up a very large donation: a converted Bluebird school bus, with two exam rooms inside. Hardt organized a massive crew of volunteer doctors and medical students from the University of Florida, where she teaches, and raised the money to hire a driver and a full-time nurse. The "clinic on wheels" first made it out to the hotspot in 2010, parking right inside one apartment complex there. Patients could walk in without an appointment and get treatment free of charge, approximating the experience of a house call. 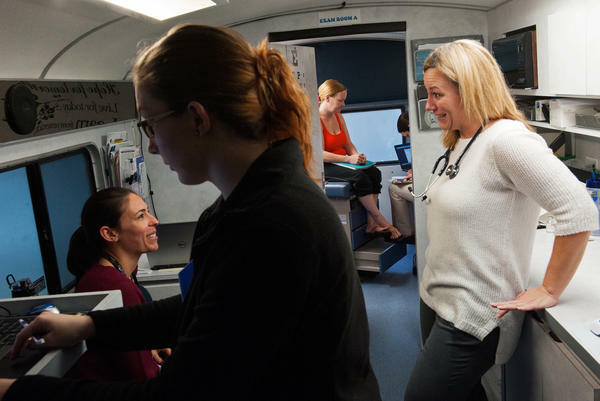 Today, the mobile clinic gets an average of 5,000 visits from patients per year, in under-served areas all over Gainesville. But the clinic is really just one piece of the puzzle. Because after the day that Hardt and the sheriff matched up their maps, they kept digging into the data. And, a few years later, Hardt made some new maps. They showed that the crime in the hotspot included the highest concentration of domestic violence, child abuse and neglect in Gainesville. That revelation brought Dr. Hardt back to her original mission — to head off bad health outcomes in the most vulnerable kids. So she teamed up with Sheriff Darnell and other local groups and grass-roots organizers from the neighborhood. They collaborated to create the SWAG (Southwest Advocacy Group) Family Resource Center, right in the Linton Oaks apartment complex. The SWAG Center opened in 2012. Kids can come play all day long. There's a food pantry, free meals, a computer room, AA meetings. A permanent health clinic is slated to open up across the street next week. All the resources here are designed to decrease the likelihood of abuse and neglect by strengthening families. "I think we knew it intuitively — that health issues are associated with crime, [and] crime is associated with health issues and poverty," Darnell says. "But seeing that direct connection literally on a map ... it helped to break down a lot of walls." Child abuse and domestic violence are still serious problems, but there has been a small drop in the numbers of such calls over the past few years, according to the data. Hardt says that investing in families and health now can help kids grow up healthy — and save money in the future. "Conservatives or liberals, everybody gets that," she says. 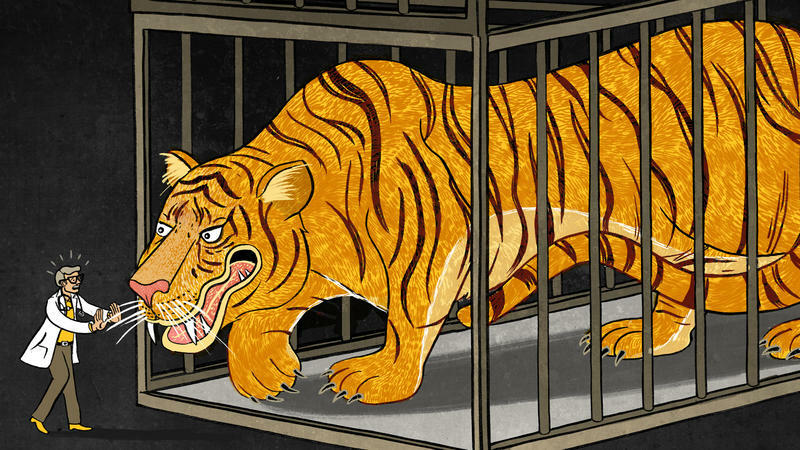 "That we have limited resources and we need to really spend them wisely. I think the maps — the hot spot maps — just tell us policywise, where we need to be going and what we need to be doing." Hardt's next goal is to make more people aware of the links between health and early education. Last summer, the county got a new superintendent of schools. Hardt has been to visit him three times already — maps in hand. This story is part of the NPR series, What Shapes Health? 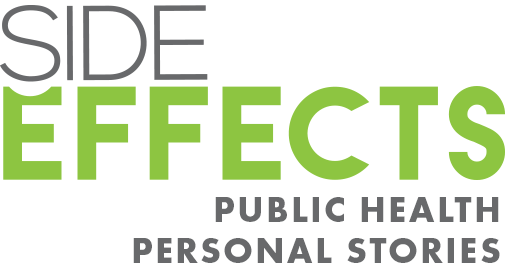 The series explores social and environmental factors that affect health throughout life. It is inspired, in part, by findings in a poll released this month by NPR, the Robert Wood Johnson Foundation and the Harvard T.H. Chan School of Public Health. No matter how much you know about a problem, sometimes it's impossible to solve it without the help of an outsider, someone who can see it with fresh eyes. In this next story in our series What Shapes Health?, NPR's Laura Starecheski takes us to Gainesville, Fla. We're going to meet an unlikely team of problem solvers - a doctor and a sheriff. Their goal - to find and protect the city's most vulnerable children. LAURA STARECHESKI, BYLINE: Nancy Hardt is a doctor with an unusual double specialty. She's both a pathologist and an OB-GYN. For the first half of her career, she brought babies into the world. Then she switched to doing autopsies. NANCY HARDT: Birth and death; it's the life course, and that's what I want to work on. STARECHESKI: In the past few years, Hardt learned about some research that changed her view of how exactly that life course unfolds. This research shows that kids who have tough childhoods - poverty, abuse, neglect, witnessing domestic violence - are actually more likely to be sick when they grow up, more likely to get diseases like diabetes and heart disease, and more likely to die earlier. HARDT: I want to prevent what I'm seeing on the autopsy table. I got to say, a lot of times I'm standing there going I don't think this person had a very nice early childhood. STARECHESKI: Back around 2008, Hardt was obsessing about this problem. She wanted to do something to intervene on a large scale, not just patient by patient. She decided to try to find the kids in Gainesville who were the most likely to have tough childhoods. So by looking at Medicaid records, she made a map that showed exactly where Gainesville children were being born into poverty, block by block. Right away she noticed something weird. In a one square-mile section of southwest Gainesville, she saw there had been about 450 babies born into poverty in the few years before. HARDT: That just didn't make sense to me. STARECHESKI: Because this was a place she thought was all fancy developments and mansions. So Hardt took her map of Gainesville with the poverty hotspot marked in bright blue and started showing it to people. She'd ask them what is this neighborhood? What's going on over there? Eventually she brought her map all the way to the CEO of her hospital. HARDT: And he said this is so interesting. I think you need to go show it to the sheriff. STARECHESKI: He didn't say why Hardt should go visit the sheriff, just that she should go. HARDT: I was afraid to go to the sheriff, first of all, because she carries a gun, and I try to avoid dealing with law enforcement whenever possible. STARECHESKI: But Hardt steeled herself. She put on her white coat to go meet the county sheriff, Sadie Darnell. SHERIFF SADIE DARNELL: Oh, gosh, I guess I was nervous about meeting Dr. Hardt, too (laughter). From the standpoint of I may have a gun, but she's got the brains. STARECHESKI: When Hardt arrived, she laid out her poverty map on the sheriff's desk. HARDT: The sheriff said this map is so interesting. Would you like to see my map? DARNELL: My map was a thermal mapping of high crime incidence. STARECHESKI: Sheriff Darnell's map showed that the highest concentration of crime in Gainesville was in a one square-mile area that overlaid exactly with Dr. Hardt's poverty map. DARNELL: It was an amazing aha moment. HARDT: We kind of blinked at each other, and then we said, simultaneously, we got to do something. STARECHESKI: First Hardt had to know more. What did all this crime look like? How was it affecting kids? Sheriff Darnell had an answer. DARNELL: She said you need to ride with the deputies and see for yourself. STARECHESKI: I retraced Hardt's steps with Sergeant Sherry French. STARECHESKI: Housing is what people in Gainesville call low-income housing projects. Out here, just outside the city limits, the isolated apartment complexes have names like Majestic Oaks and Holly Heights. FRENCH: This one has a tarp over the roof because the landlord won't even fix the roof in it where it's leaking. STARECHESKI: Some houses have mold and mildew covering the outside, broken windows, no installation. FRENCH: There are a lot of people in here living in poverty. You know, not having food for their kids. STARECHESKI: Hunger, substandard housing, lack of heat - on her ride-alongs, Dr. Hardt was tallying up all the things that make it hard for kids to grow up healthy. She also noticed something else. HARDT: Where are the businesses, you know? Where's the Jiffy store? Where are the day care centers? Where are the churches? STARECHESKI: And, she thought, where is the medical care? She mapped it out and found that the closest place you could go if you're uninsured, which many people here are, is the county health department, almost two hours by bus each way. Joan Canton has lived in the Linton Oaks complex for over 10 years. JOAN CANTON: If you can't jump on the bus because you have no money or you can't take all of your kids with you, it's really difficult. STARECHESKI: Canton calls her neighborhood a medical desert. This was a problem Dr. Hardt could tackle. She would bring medical care to the hotspot by rustling up a very large donation - a converted Bluebird school bus, with two exam rooms inside. HARDT: A clinic on wheels. STARECHESKI: Have you ever driven it? HARDT: No. You would not want me to drive it (laughter). STARECHESKI: Hardt organized a massive crew of volunteer doctors and raised the money to hire a driver and a full-time nurse, Ginny Bruzzese. Bruzzese says she's seen patients who haven't been to the doctor in a decade. But when the clinic parks right outside their apartment, it's too easy not to go. GINNY BRUZZESE: We go to their community. It's like having - you know, you're doing house calls. STARECHESKI: Since 2010, Hardt's been taking the mobile clinic all over Gainesville, wherever there's a hotspot. But the clinic is really just one piece of the puzzle because after that day that Hardt and the sheriff matched up their maps, they kept digging into the data. And Hardt made some new maps. They showed that on top of everything else, the hotspot had the highest concentration of domestic violence, child abuse and neglect in Gainesville. Here's Sheriff Darnell. DARNELL: I mean, I think we knew it intuitively that health issues are associated with crime. Crime's associated with health issues and poverty, but seeing that direct connection literally on a map, it helped to break down a lot of walls. STARECHESKI: So Hardt and the sheriff collaborated again to help create the SWAG Family Resource Center, right in the Linton Oaks apartment complex. Katie Fields, a former intern from the sheriff's department, ended up managing the center. KATIE FIELDS: So it is snack time here at the SWAG Family Resource Center. The kids just came inside after learning how to juggle. STARECHESKI: All the resources here are designed to decrease the likelihood of abuse and neglect by strengthening families. Kids can come play all day long. There's a food pantry, free meals, job postings, AA meetings. And next week a permanent health clinic will open up across the street. There's still a serious problem, but over the past few years, Sheriff Darnell says there's been a small drop in the numbers of child abuse and domestic violence calls. That's a bit of progress on Hardt's original mission - to head off bad health outcomes in the most vulnerable kids. HARDT: And I think the maps - the hotspot maps - just tell us policy-wise, where we need to be going and what we need to be doing. STARECHESKI: Hardt's next target is to link health and early education. Last summer, the county got a new superintendent of schools. Hardt's been to visit him three times already - maps in hand. Laura Starecheski, NPR News. BLOCK: Our series, What Shapes Health?, is based in part on a recent poll by NPR, the Robert Wood Johnson Foundation and the Harvard T.H. Chan School of Public Health. You can find the results at npr.org. Transcript provided by NPR, Copyright NPR. In the summer of 2014, the American Academy of Pediatrics announced that it would be establishing the Center on Healthy, Resilient Children, an educational and service organization to help children who experience toxic stress. Imagine that the next time you go in for a physical, you're told there's a new tool that can estimate your risk for many of the major health problems that affect Americans: heart disease, diabetes, depression, addiction, just to name a few. 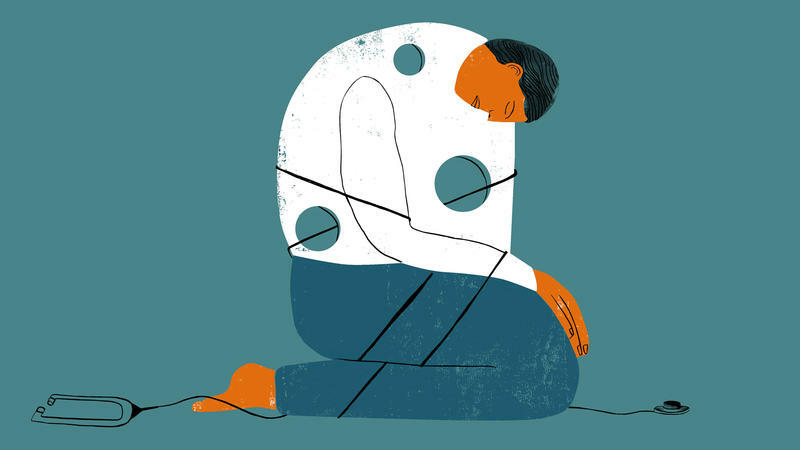 It's not a crystal ball, but might hint at your vulnerability to disease and mental illness — long before you start smoking or drinking, gain a lot of weight, develop high blood pressure or actually get sick.